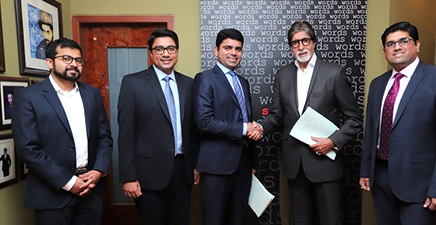 We, at The Muthoot Group, have engaged Mr. Amitabh Bachchan as our Brand Ambassador. Padma Vibhushan Shri Amitabh Bachchan will hereafter be representing The Muthoot Group across our national campaigns. Shri Amitabh Bachchan, also widely known as the “Shahenshah of Bollywood” has appeared in over 190 Indian films in his Bollywood career spanning almost five decades. He is widely regarded as one of the greatest and most influential actors in the history of Indian cinema as well as World Cinema. Speaking of the association, Alexander George Muthoot, Deputy Managing Director, The Muthoot Group said,”We are extremely pleased that Mr. Bachchan will be representing The Muthoot Group as our Brand Ambassador. Mr Bachchan is a living legend – both on and off the screen. He combines his extraordinary performance on screen with his legacy and values – precisely what we, at The Muthoot Group, also stand for. The diverse roles that he has played over his illustrious career also resonates with our 18-diversified business divisions – all of which are doing meaningful work in their respective areas. We also found his strong association with a host of social causes to resonate with our nature and culture of business. With more than 70% of our 4500+ branches in Semi-urban and rural areas of India, we serve more than 2 Lac customers every day – which is our contribution to financial inclusion and nation-building. We are certain that this association will be an enormous momentum boost for us and will resonate across generations of fans. Speaking of the partnership the legendary actor said, “I am proud to be associated with The Muthoot Group which is known for its uncompromising values and trust earned over 131 years of excellence in business. Over these years, The Muthoot Group has brought joys to the lives of millions of Indians and have helped them prosper in life through their diverse financial products and services. I was particularly amazed to learn that two of their divisions Muthoot Healthcare and Muthoot Education are run purely for non-for-profit reasons and have been doing great work for many years now. I look forward to this association and wish everyone associated with The Muthoot Group, the very best in their lives!.